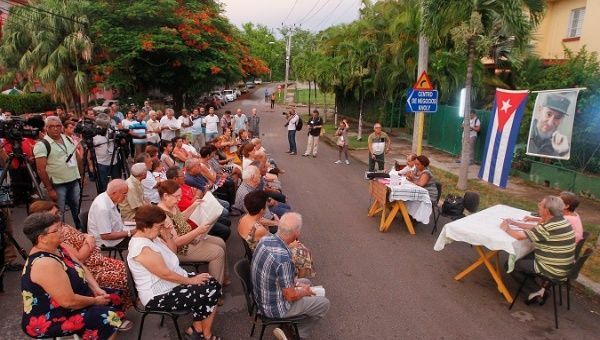 Cubans have participated in local debates on the constitutional reforms since Aug. 13. Oct 2 (teleSUR) The participatory process to approve constitutional reforms in Cuba began its second phase Monday after a month and a half of the citizens’ debate roundtables organized to gather suggestions for the 224 articles of the constitution. Until Nov. 15 the people of Cuba will discuss and debate possible modifications to the reform that must be processed by members of the National Assembly for Popular Power. The revised text, which will include citizens’ concerns, will be voted on and ratified through a referendum scheduled for February 2019. It is estimated that 135,000 debates will be organized to facilitate the active participation of thousands of people throughout the island. According to local media, the topics that have gained the most attention have been the participation of Cubans in the country and abroad, investing in projects, the sustainable use of natural resources, the inclusion of the right to an abortion in the constitution, and access to basic services. Many people have proposed that Cubans outside the country with “legal resources” should be able to participate in national investments. Gerardo Hernandez, a legislator, and vice-director of the Higher Institute of International Relations at the University of Havana said the debate around the constitution is unique and extends to every neighborhood, work site, and school. Hernandez also highlighted the reaffirmation of the socialist character of the political, economic and social system in the Caribbean country, as well as of the governing role of the Communist Party; two principles “ratified” in the project and “supported” in the citizens’ debates. The debates, organized to complement the text approved by the Assembly on Jul. 22, began on Aug. 13 and will continue until Nov. 15.